Something so small can make me so weirded out. I don’t know if your cats do this or not, but Duncan will sometimes sit with his tail perfectly straight and without moving it at all. This doesn’t sound like it would be weird, but trust me, it is. It makes me think about how weird it is that he is always moving it and that is becomes strange when he doesn’t move it. Bizarre. The little things that seem so insignificant make my world go ’round. Another reason my cat is a cross-species organism. Adventures in Grocerystoreland: Do we have enough eggs? 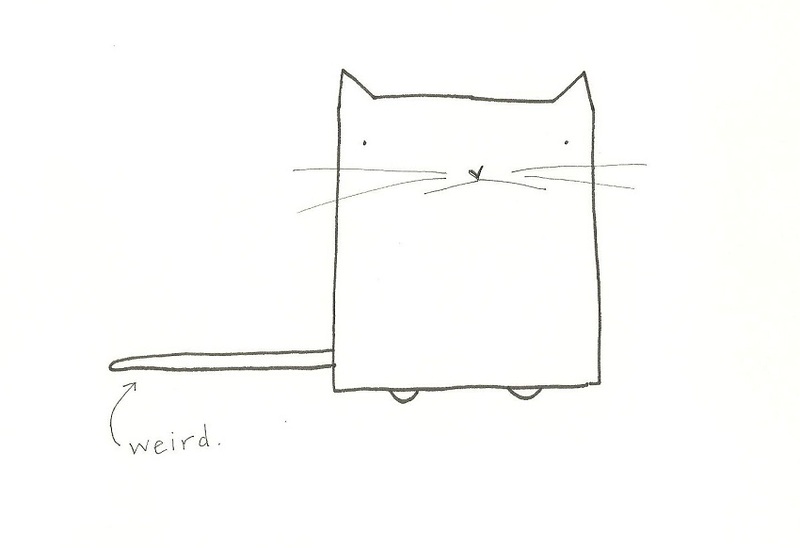 Weird and proud, that’s us. What’s also weird is when they turn their head just enough to catch sight of that tail and then go totally ballistic, as if they had no idea what it was, or who put it there! My dog, will sit still and then all of a sudden attack the furry tail of his that wasn’t moving. It’s like he all of a sudden feels a tickle and attacks. It startles me.